Judge Elizabeth Harris was sworn in to the Colorado Court of Appeals on July 23, 2015, when she zipped into the black robe and transitioned from an advocate to an arbiter, advancing an already impressive legal career to the next echelon. Judge Harris developed a sense of justice at an early age. When she was in fifth grade, her mother — a single mom and homemaker — decided to attend law school, eventually working as a court-appointed juvenile attorney and demonstrating an activism that clearly impressed the future judge. In fact, Harris’ mother must have been the role model of choice for all of her children, each of whom ultimately became a lawyer. Today, Judge Harris’ sister, Pamela Harris, is on the United States Court of Appeals for the Fourth Circuit. Judge Harris also has a brother and a sister who practice criminal defense in Portland and Washington, D.C. respectively. From her mother’s inspiring story to her own charismatic work ethic, Judge Harris has made quite a name for herself in the legal profession. After attending Georgetown University and New York University Law School, Judge Harris became a primarily appellate attorney. 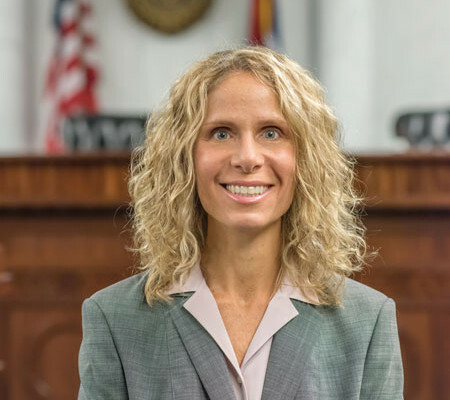 She clerked for The Honorable John Porfilio on the Tenth Circuit Court of Appeals, where she learned the real-world pressures and challenges that judges face. Later, she worked on federal criminal appeals in Denver’s Federal Public Defender’s office, where she stepped into an advocate’s role. In private practice, she fought for clients on civil appellate matters while an associate at Jacobs Chase (now Husch Blackwell). More recently, she operated a solo appellate practice in Denver until she was drafted by Governor Hickenlooper to join Colorado’s busiest appellate court. As she reflects on her transition to the bench, Judge Harris confesses that it has been easier than she expected. She reminds us that although appellate judges are somewhat confined by deferential standards of review and the arguments of the parties, they are liberated in the sense that they do not have to be tied to any particular client’s argument. An appellate judge can apply the law neutrally, whereas an advocate must remain loyal to his or her client’s position. Judge Harris has also gained a new perspective from the other side of the podium. She has often been perplexed when observing attorneys playing it too safe where there is room for development in case law. She advises appellate attorneys to “spend a lot of time with your case and be thoughtful about the arguments.” As she says, “There is room for attorneys to be pushing on some issues.” At the same time, she notes that “they could yield on other, less persuasive issues.” Judge Harris stresses that careful reasoning and precision are the hallmarks of great appellate advocacy. She jokes that when she was a lawyer in private practice, she would routinely hear appellate judges presenting at CLEs, imploring lawyers to shorten their briefs. Only now does she fully understand the unanimous plea of all those judges and their word count admonitions. “Word count is not persuasive,” she chides with a knowing smirk, acknowledging herself as a former culprit. The collegial decision-making on the appellate panel has come naturally and agreeably for Judge Harris. “My colleagues are very open to the other judges’ opinions on cases,” she says. She finds that judicial deliberations reflect “a really good balance between standing firm on one’s convictions while also keeping an open mind.” In her view, that seems to be the best way for the panel to work. Judge Elizabeth Harris took office as a Judge of the Colorado Court of Appeals, replacing the retiring Judge James Casebolt on July 23, 2015.